...and nine other things we hope will never happen again! When it comes to current events, 2015 sure was a roller coaster ride, with enough highs, lows, twists and turns to add a sprinkling of drama to even the most mundane topics. It was thrilling and puzzling and confusing at times, but we wouldn't trade it for anything. Wait, we take that back—we'll gladly sacrifice a few corrupt officials to Satan for a repeat of 2015's top highlights, and we'll throw in a dozen more to ensure that some things will be left in the past, where they rightfully belong. Check them out below! The year 2015 started on a high note with Pope Francis visiting the country from January 15 to 19, drawing ecstatic crowds wherever he went. The weather may not have been very cooperative then, but that certainly didn't stop the Filipinos who waited for hours just to catch a glimpse of Lolo Kiko. An estimated six million people also attended the Pope's final mass at Luneta, smashing records for a papal event. We ain't the top Catholic country in Asia for nothing, guys! In June, the Office of the Ombudsman suspended Makati Mayor Junjun Binay and 14 other local government officials for their supposed connection to anomalies in the construction of the Makati Science High School—a move that required massive cojones. Of course, the Binays didn't back down, claiming that this was all politically motivated harassment by the administration. For two days, Junjun holed himself in his posh City Hall quarters while his rowdy supporters clashed with the police, even throwing chairs to stop DILG officials from posting the suspension order. Junjun finally stepped down on July 1. The past year also saw the unprecedented rise to fame of Alden Richards and Maine Mendoza aka Yaya Dub, whose love team quickly became everyone's noontime addiction. The two stars’ Kalyeserye segment, where they do live improv acting alongside their Lolas, the Rogelios and a plethora of wacky characters was a social media phenomenon, with AlDub-related hashtags constantly reigning supreme on Twitter and Facebook. The AlDub phenomenon reached its peak in October with Sa Tamang Panahon, Eat Bulaga’s grand benefit fans day (with no commercial breaks! ), which had Alden and Maine finally sharing a stage for the first time ever, sending shockwaves of kilig across the country and breaking the global Twitter record for the most number of tweets sent within 24 hours. Not to be outdone, It’s Showtime tried to give AlDub a run for its money by getting YouTube sensation Pastillas Girl AKA Angelica Jane Yap to search for her Mr. Right via a dating game. Unfortunately, this caught the attention of the MTRCB, which expressed its concern over the "pimping" of Angelica. The segment went on after ABS-CBN assured the public that Angelica will always have a say in things that concern her, and Pastillas Girl eventually found her very own Mr. Pastillas in Richard "Chard" Parajinog. P-Noy welcomed September by having the PNP Highway Patrol Group lead the implementation of travel rules in Metro Manila, particularly along EDSA. We were all skeptical at first, but amazingly, EDSA did become slightly less of a hellhole when the HPG took over. May himala! 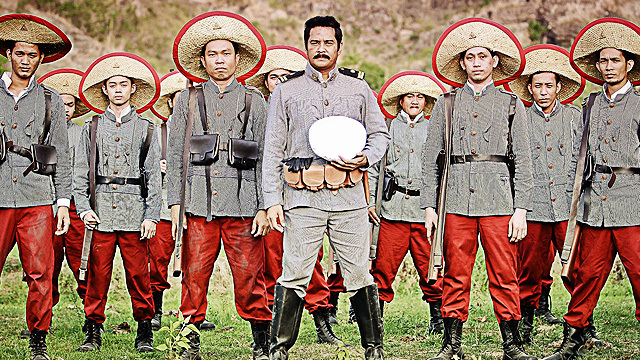 Few Pinoy films were able to rouse our patriotism quite like Heneral Luna, a gripping biopic about the notoriously brash Antonio Luna's leadership during the Philippine-American war. After watching the movie (which was nearly pulled out in theaters! ), many of us started seeing our country's sordid past in a whole new light—as real events with repercussions that can still be felt until now rather than mere dates that should be memorized for exams. The Philippines hosted the Asia-Pacific Economic Cooperation Summit in 2015, a series of meetings that aimed to promote and strengthen inclusive growth in the Asia-Pacific region. The APEC Summit culminated in the APEC Economic Leaders’ Meeting held in November, which bought a number of the most influential (and most handsome) heads of state to our turf for a few days...and the nightmarish traffic that accompanied their arrival. Ang lala na nga ng traffic, tinitilian pa ng girlfriend mo si Justin Trudeau. Sometimes, we just can’t win. But hey, if this’ll make our country better, why not? The Philippines has always been a strong contender in beauty pageants since 2009, but a third Miss Universe crown still remained elusive. The drought ended this December, when Pia Wurtzbach finally nabbed the coveted title in a heart-stopping finale that almost left us devastated after host Steve Harvey totally bungled the final announcement. Talk about ending 2015 with a bang! The high we had from the papal visit quickly dissolved upon learning that 44 of the country’s finest, bravest Special Action Force soldiers were killed in Maguindanao during an encounter against the Bangsamoro Islamic Freedom Fighters and the Moro Islamic Liberation Front in a bid to capture notorious Malaysian terrorist Marwan. While the soldiers succeeded in killing Marwan, their victory was marred with controversy when it was discovered that the operation, led by suspended PNP Chief Alan Purisima, was deliberately kept a secret from PNP acting chief Leonardo Espina, then-DILG Secretary Mar Roxas, and DND Secretary Voltaire Gazmin. Tsk tsk. Also in May, a huge fire broke out at the Kentex slipper factory in Valenzuela when sparks from welding activities landed on flammable chemicals. The blaze, which killed around 72 people, turned out to be the third worst fire incident in Philippine history, coming after the Ozone disco tragedy and the Manor Hotel fire. The disaster shed light on need for stricter fire safety standards, as well as the inhumane treatment of factory workers. Tea shops across the country found themselves scrambling to protect their reputations after two people died after drinking lethal milk tea from the Ergo Cha Tea Shop in Sampaloc, Manila. An investigation found that the milk tea was laced with oxalic acid, a strong poison that can be lethal in large doses. Several milk tea shops then released assurances that their products are prepared following rigorous safety standards, and things went back to regular programming after a while. Members of the Iglesia Ni Cristo held EDSA hostage from August 27 to 31 to protest against the Department of Justice, which allegedly meddled in the church's internal affairs by taking action on the illegal detention case filed by expelled minister Isaias Samson Jr. To make things worse, the church scheduled their rally at super traffic Ortigas on a busy weekday, right smack at the start of a massive three-day SM Megamall sale. What was practically a NAIA urban legend quickly became headline fodder in September after airport personnel allegedly tried to extort P30,000 from American missionary Lane Michael White, whose bag was found to have a bullet after passing through the X-ray machine several times. Since then, more "laglag-bala" victims have spoken up about the alleged shenanigans at the airport, prompting panicked travelers to wrap their luggage in cling wrap to prevent any possibility of thievery. The Philippines gets battered by a number of severe storms every year, and 2015 was no exception, with 14 typhoons pounding across the country in the last few months. Typhoon Lando led the pack, leaving 28 people dead in October and causing billions of pesos' worth of damage in the handful of days it stayed in Luzon. Typhoon Nona, meanwhile, landed at second place, causing the deaths of 42 people and leaving a P6.46-billion trail of damage in its wake. Climate change isn't a joke, guys. October 2015 marked the filing of certificates of candidacy for the 2016 elections, and it turned out to be the circus we all knew it would be. Grace Poe, Jejomar Binay, and Mar Roxas all filed their COCs as expected, but were thrown in a loop for a little while when Miriam Santiago announced that she has beaten stage 4 lung cancer and will run as well. Rodrigo Duterte was a no-show during the filing of COCs, but was eventually persuaded to replace Martin Diño as PDP-Laban’s presidential bet. Campaign season hasn't properly started yet, but it’s impossible to miss the feisty statements, black ops, and mudslinging. If you think that's already a ton of drama, well, it's only going to get dirtier in the coming months. Will we ever see proper platform-based campaigns in this lifetime? Right now, all signs point to NO. Is This Bikini-Clad Blonde Really The Croatian President?